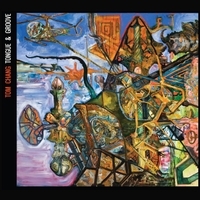 Look at the lineup on Tom Chang's Tongue & Groove! There is literally no way that this album could be anything less than great. Listening, repeatedly, to Tongue & Groove has, in fact, borne this out. Chang utilizes the increasingly popular two-reeds / bass / drums configuration to frame brief, but consistently spectacular, improvisations in the midst of his surprisingly knotty and complex multi-sectioned compositions. Everyone rises to the occasion here because the only way to play Chang's cutting edge compositions successfully is to rise to the bloody occasion! The only player on Tongue and Groove who I wasn't familiar with as the result of logging long, hard hours with the stereo and a cold brew was the leader himself. Chang is a native of South Korea who, as a pre-teen, emigrated with his family to Canada where he took up the guitar. Under the spell of Jimi Hendrix, Jeff Beck, and Jimmy Page, Chang's musical curiosity led him first to the blues, and then to jazz. Ultimately, Chang moved to the US in the mid-1980s; first to Los Angeles to study at GIT, and then to Boston to attend Berklee where he studied with Mick Goodrick. After moving, as most jazz musicians do, to New York City, Chang worked with Rich Perry, Rudresh Mahanthappa, and David Binney, eventually forming his own band which gigs at venues such as Cornelia Street Café (where Chang now curates the jazz performance series). The music on Tongue and Groove is dense and dark, full of wild twists and turns. Saxophonists Greg Ward and Jason Rigby play off one another quite effectively in the context of Chang's compositions, and their distinct improvisational approaches add a lot of depth. The rhythm section here is simply one of the best around. Cleaver and Lightcap balance serious thunder with sensitive delicacy, easily negotiating Chang's constantly metrically-modulating melodic lines and odd-metered grooves. The album opens and closes with one of Chang's most appealing pieces, "Spinal Tap," a quirky tribute to the mythical hard rock band featured in the movie of the same name. Chang isn't kidding about his rock roots, as he happy flies his freak flag high throughout Tongue and Groove. Listening to his solos on the bizarrely bluesy "Bar Codes" and the title track, it's not hard to imagine Chang doing some headbanging at some point in his life. Chang's impassioned soloing is a breath of fresh air. That said, the majority of the music on Tongue and Groove is intricate and beautifully crafted, with strong Indian flavors; somewhat like Mahanthappa's recent work. Oddly, the contributions of percussionist Akshay Anatapadmanabhan seem out-of-place, as if they were overdubbed or recorded in a different location. The very dry, close-miked sound of the kanjira and mridangam doesn't mesh well with the spacious sound of Cleaver's drums. This is a minor quibble, however, and doesn't detract from Tongue and Groove's standing as one of the years more auspicious debut recordings. Track Listing: Spinal Tap / Goes to 11; Djangolongo; Variations for Piano Op. 27; Sleepwalker; Tongue & Groove; Scatterbrain; Bar Codes; The Logos; Entangoed Heart; Spinal Tap (Tk. 2). Personnel: Tom Chang: guitar; Greg Ward: alto saxophone; Jason Rigby: tenor saxophone; Chris Lightcap: bass; Gerald Cleaver: drums; Akshay Anatapadmanabhan: kanjira, mrindigam; Subash Chandran: konnakol.